Google uses the "did you mean" feature, which normally corrects misspellings, to illustrate a nerdy joke: defining the word "recursion" using "see recursion" and pointing to the same definition. "A recursive process is one in which objects are defined in terms of other objects of the same type. Using some sort of recurrence relation, the entire class of objects can then be built up from a few initial values and a small number of rules," explains MathWorld. 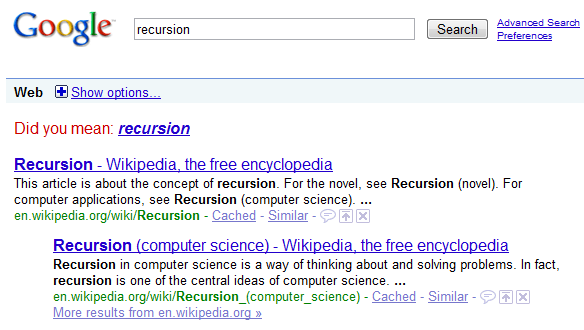 For more information, search Google for [recursion]. The funny part is if you keep clicking on the did you mean link, Google can show you slightly different results. Not quite sure where I heard that first. is there any good collection for all (search based) google eastereggs? Nice try. How about this? - What is the difference between 'primitive' and 'blob'? - It's like between cake and a piece of it. - See? You got it! That's funny! In fact, I'd have to say that's funny as a shirt I once saw that said, "The Department of Redundancy Department." I love how Google comes up with stuff just for the fun of it. I think it's great! Geeks! Nerds Looosers!!! Ahh hahha! Into the locker, Q-ball! It no longer works (not just in Opera or IE). So they decided it is a bug after all. It still works for me in IE and Firefox for me on July 28th 2009.
heh, I thought it was a google fail. Things like this are what win Google a place in my heart. The problem is that is working only every other hour of the day. Regardless of the browser. Just by chance people have been trying it either the wrong hours or the right ones and thinking it is the browser. Lol :] Brought a smile to my face. It can take a lifetime to truly understand recursion. It does still work . In a recursive definition, something is not defined *exactly* in terms of itself, but something slightly different (such as defining the solution to a problem in terms of the solution(s) of smaller instances of the same kind of problem). In Google's case, 'recursive' is not defined recursively, but circularly ... *exactly* in terms of itself. This is not the right definition, and could be confusing. Brownie points for a clever idea, though :-). Its actually a good option when we dont know the spelling or the word exactly. But I spelled it right!